Home Run Real Estate Team is your local real estate connection to get a positive, helpful partner when buying or selling a home in the Clarksville, TN area. Thanks again to our good friends at ClarksvilleNow.com for providing us with the lineup for this weekend’s events! Here is a little preview from their website. To view the entire lineup click here. This event offers free admission and parking and will feature over 40 booths of one of a kind items hand made by local artisans. What a great place to start your Christmas shopping and pick up items that can’t be found anywhere else! With the shortened season for Christmas shopping this year, folks have got to get started crossing names off of that shopping list early this year. Thankfully, Clarksville has no shortage of local artisans selling unique and handmade wares! This is another great opportunity to find great gifts but also give back to the community since all proceeds made from this event will go to benefit local and community missions. The 38th annual Holiday market will feature a silent auction with over 50 items and booths upon booths of vendors selling items such as Christmas items, jewelry, handmade crafts, and even baked goods and frozen foods! Those frozen meals will surely come in handy when all iof the relatives show up for the Holiday season! while admission and parking are free, there will be lunch served in the fellowship hall for a small fee of $7. Come, shop, eat, and enjoy the day! This event hosted by the Girl Scouts of America is an opportunity to bring young girls to socialize and make crafts with current girl scout members, ask questions about the organization, and get a sense of what it will be like to become a Girl Scout. Volunteers and Leaders will also be available to answer any questions from parents about what becoming a Girl Scout will entail. Any girls that sign up to be in the program at this event will receive their first patch! Come down this weekend to enjoy fine arts and crafts from local artists, door prizes, and concession. This event is free admission! Thanks for checking out our blog! Enjoy this article? Subscribe to our blog for daily updates featuring home and property listings in Clarksville, TN, recipe of the week, home and yard maintenance tips, up to date financing information, and more events going on around Clarksville. You can also find us on Facebook here and follow us on Pinterest here. Categories: Clarksville Home Listings, Clarksville Real Estate, Clarksville TN, Clarksville TN Events, Clarksville TN Events Calendar, Homes for Sale Clarksville, Real Estate, Real Estate Clarksville, TN, TN, What's Going On Clarksville | Tags: 2013 Events Clarksville TN, Chris Sutton, Chris Sutton Home Run Real Estate Team, Chris Sutton Platinum Realty, Chris Sutton Realtor, Clarksville Holiday Markets 2013, Clarksville TN, clarksville tn events, clarksville tn realtor, Events, Facebook, Home Run Real Estate Team, home run real estate team clarksville tn, Home Run Real Estate Team Facebook, Home Run Real Estate Team Pinterest, homes for sale Clarksville TN, house listings clarksville tn, November 16th Events Clarksville TN, Pinterest, Platinum Realty Clarksville Tn, Weekend Lineup Clarksville TN | Permalink. 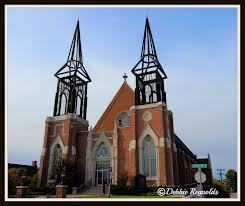 Pumpkin Chunkin’ Fall Festival – Trinity Episcopal Church 317 Franklin Street 10am-3pm. What a fun event for the whole family! This fall festival will include a silent auction, raffles, cake walks, mega obstacle course inflatable, magician, baloon artist, face painting, crafts, live music, and more. The main attraction however is the pumpkin chunkin’ 10 ft tall catapult. For a small fee, participants can purchase a pumpkin, load it on the catapult and chunk their pumpkin up to 40 ft in the air! Don’t forget to stop by the food booth (where all proceeds benefit the F.U.E.L program feeding hungry kids in the Montgomery County School System) and purchase a cup of their famous New Brunswick Stew. APSU vs. Jacksonville State football game – APSU football stadium 681 Summer Street game starts at 4pm. Adult tickets – $15, Youth/Senior tickets $10, and military get in free with a valid miltary id. Come cheer on the Govs against Jacksonville State! Tickets can be purchased by credit card via phone at 931-221-7761, by cash or check only at the Dunn Center Ticket Office, or at the gate which opens 1-1/2 hrs before the game. Immaculate Conception Casino Night – tickets can be purchased at Runyon & Runyon Attorneys at Law (301 Madison Street) and Immaculate Conception School (1901 Madison Street) for $20. The event will begin at Immaculate Conception School and feature fun money gambling, silent auction, food, and 2 free drinks at the After Part taking place at The Gilroy. Musical guests at the Gilroy will include Leigh Nash of Sixpense None the Richer and special guest Gabe Dixon. Categories: Clarksville Home Listings, Clarksville Real Estate, Clarksville TN, Clarksville TN Events, Clarksville TN Events Calendar, Homes for Sale Clarksville, Real Estate, Real Estate Clarksville, TN, TN, What's Going On Clarksville | Tags: 2013 Events Clarksville TN, APSU vs. Jacksonville State football game, Chris Sutton, Chris Sutton Home Run Real Estate Team, Chris Sutton Realtor, Chris Sutton Reliant Realty, Clarksville TN, clarksville tn events, clarksville tn realtor, Events, Facebook, Home Run Real Estate Team, home run real estate team clarksville tn, Home Run Real Estate Team Facebook, Home Run Real Estate Team Pinterest, homes for sale Clarksville TN, house listings clarksville tn, Immaculate Conception School Casino Night, Immaculate Conception School Clarksville, Pinterest, Pumpkin Chunkin Fall Festival, Pumpkin Chunkin fall festival trinity episcopal church, Reliant Realty, Reliant Realty Clarksville TN, Trinity Episcopal Church Clarksville TN, Weekend Lineup Clarksville TN | Permalink. Wow, what a fun-filled calendar we have for you guys this weekend! With all of the opportunities for safe Trick-or-Treating this year, your kids will probably double their candy loot this year! Thanks again to our good friends at ClarksvilleNow.com for providing us with the lineup for this weekend’s events! Here is a little preview from their website. To view the entire lineup click here. Austin Peay vs. UT Martin Homecoming Football Game – APSU football stadium 681 Summer Street 4pm. Adult tickets – $15, Youth/Senior tickets $10, and military get in free with a valid miltary id. Come cheer on the Govs for their homecoming football game this season! Tickets can be purchased by credit card via phone at 931-221-7761, by cash or check only at the Dunn Center Ticket Office, or at the gate which opens 1-1/2 hrs before the game. Jeepers Creepers Crawl 5k benefiting the Health Occupational Students of America club – 8-11am. Kenwood High School. Registration begins at 8am, 5k starts at 9:30am in the Kenwood High Parking Lot. Registration is between $15-$25 allowing discounts for Clarksville Montgomery County School System Students and teams of 4-6, while kids race free. Prizes for top male and female finishers in each age group. A portion of the proceeds will benefit the American Red Cross. Cystic Fibrosis Foundation Craft Fair – 8am-2pm tickets for adults are $2 and kids 1 and under are free. Taking place at the Clarksville Speedway at 1600 Needmore Rd. Stop by to shop for a cause and get a jump on your holiday shopping list! Crossroads Fellowship’s Fall Festival – 1-3pm at Crossroads Fellowship Church 2687 Tiny Town Rd. Events for the afternoon will include candy, games, costume contests, raffles, and more. Bring the whole family and let the little ones do a little trick or treating in a safe environment, or get double use out of those costumes this year! 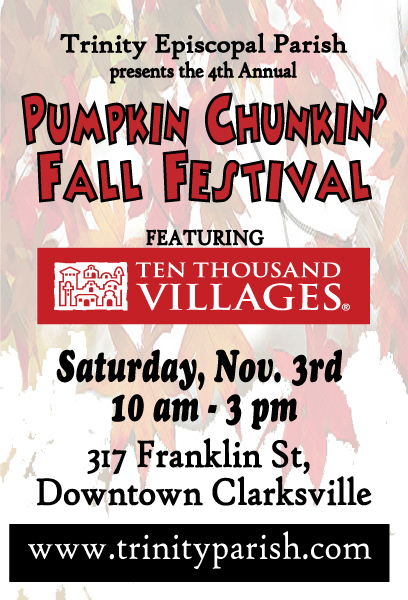 Fright on Franklin – 3-7pm Bring the kids out to Downtown Clarksville on Franklin Street this Saturday for another fun, safe, trick-or-treating opportunity. The evening will feature a hayride, costume contests (pre-registration required here), trick-or-treating from over 70 vendors, and more! Come on down and experience the best of our beautiful, historic, downtown. 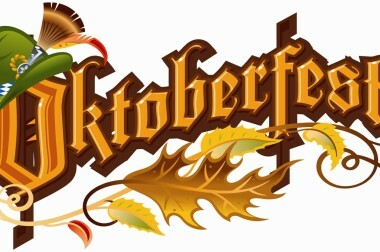 Montgomery Central Elementary School Fall Festival – 5-7:30pm @ MCES 4011 Tennessee 48. The event will feature a silent auction, costume contest, inflatables, games, food and fun! All proceeds will benefit Montgomery Central Elementary School. G.H.O.S.T – (Greater Halloween Opportunities for Safe Trick or treating) One more safe and free trick-or-treating event for all the kids held at the APSU UC Plaza at 601 College St. Bring teh kids down to APSU Sunday afternoon and take advantage of the nice weather and free candy! Categories: Clarksville Home Listings, Clarksville Real Estate, Clarksville TN, Clarksville TN Events, Clarksville TN Events Calendar, Homes for Sale Clarksville, Real Estate, Real Estate Clarksville, TN, TN, What's Going On Clarksville | Tags: 2013 Events Clarksville TN, APSU homecoming football game, APSU vs. UT Martin football game, Chris Sutton, Chris Sutton Home Run Real Estate Team, Chris Sutton Realtor, Chris Sutton Reliant Realty, Clarksville TN, clarksville tn events, Clarksville TN Fall festivals, clarksville tn realtor, Cystic Fibrosis Foundation Craft Fair, Events, Facebook, Fright on Franklin 2013, Fright on Franklin Clarksville, G.H.O.S.T. APSU, Home Run Real Estate Team, home run real estate team clarksville tn, Home Run Real Estate Team Facebook, Home Run Real Estate Team Pinterest, homes for sale Clarksville TN, house listings clarksville tn, Jeepers Creepers Crawl 5k, Kenwood High School, MCES fall festival, Pinterest, Reliant Realty, Reliant Realty Clarksville TN, SAfe Trick-or Treating opportunities 2013, Trick-or-treating alternatives for kids, Weekend Lineup Clarksville TN | Permalink. Downtown Market -Peruse tons of local vendors selling everything from fresh produce, arts & crafts, jewelery, baked goods, and more from 8am-1pm at 1 Public Square in downtown Clarksville. This will be the last Downtown Market of the 2013 Season, so come and enjoy it while you can! Go Commando Half Marathon, 5K, Fun Run, & Expo- Pre-registration for the races is required and tickets are available for purchase on their website here. Race packets are available for pickup at the Health and Fitness Expo on Friday October 19th, at the Wilma Rudolph Events Center in Liberty Park from 11am-8pm. The Expo is presented by The Runners Hub and will feature on-hand exhibitors showcasing the latest in running apparel, health and beauty products, and nutrition. Enjoy samples, demonstrations and one-on-one interaction with some of the best in the business. Pick up your race packet, bag-o-swag and some really great products from our really great sponsors. Participants in the half marathon will enjoy scenic views along Historic Downtown Clarksville and the banks of the Cumberland River. The Half Marathon begins at Liberty Park at 7:30 am and concludes at 11:30am on Saturday 10/19. The 5K will only take place inside Liberty Park and will begin at 8am on Saturday 10/19. 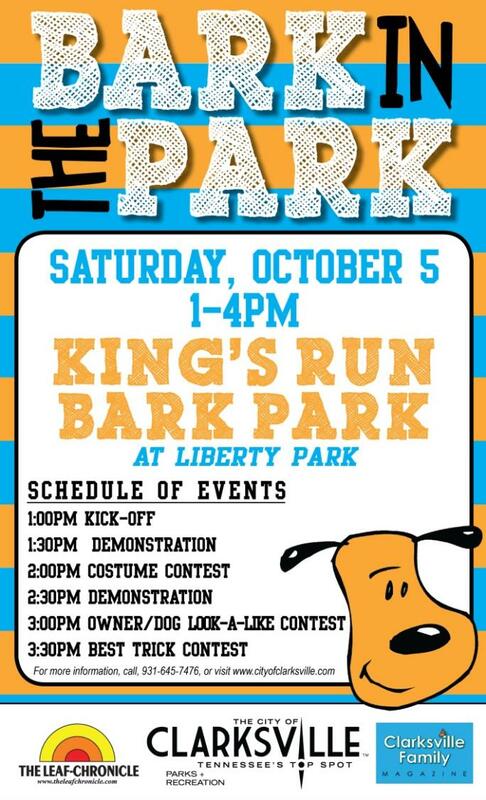 While the Fun Run is for kids 10 yrs old and younger and will begin at 11 am in Liberty Park on Saturday 10/19. 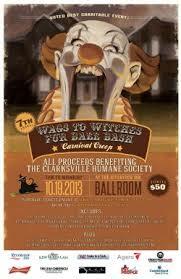 Wags to Witches Fur Ball Bash – This event benefits the Clarksville Humane Society and takes place at the Riverview Inn from 7pm-12am. Tickets are $50 and can be purchased from the Humane Society’s website here. Ticket Price includes heavy Hors D’oeuvres, fondue fountains, budweiser beer products, and door prizes. Costumes are not required but are encouraged for the costume contest. The event will also feature, a live DJ, dancing, cash bar, silent auction, and professional portraits. Jazz On The Lawn – Bring the whole family to Beachaven Winery this Saturday for live music at Jazz on the Lawn featuring the band Handsome White Boyz from 6:30-9:30pm. Sit back under the stars and sweeping trees sipping Beachaven’s finest wines in the vineyard and enjoy the company of friends or dance the summer night away. Lawn chairs, picnic baskets, and snacks are welcome but please leave all pets and outside alcoholic beverages at home. Movies in the Park – This double feature is the perfect way to celebrate Halloween and to conclude the Movies in the Park season for 2013. 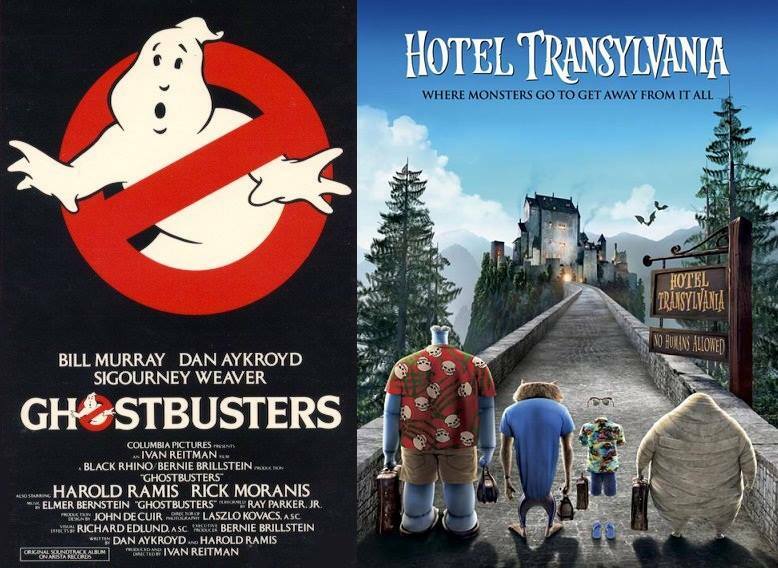 The movies this week will be Hotel Transylvania and Ghostbusters. The first movie begins at sundown at Liberty Park and Hot Cocoa will be available for purchase at the concession stand. Come early to participate in a free Zumba class. Categories: Clarksville Home Listings, Clarksville Real Estate, Clarksville TN, Clarksville TN Events, Clarksville TN Events Calendar, Homes for Sale Clarksville, Real Estate, Real Estate Clarksville, TN, TN, What's Going On Clarksville | Tags: 2013 events, 2013 Events Clarksville TN, 2013 Movies in the park, Beachaven Jazz on the Lawn, Beachaven Winery, Chris Sutton, Chris Sutton Home Run Real Estate Team, Chris Sutton Realtor, Chris Sutton Reliant Realty, Clarksville Downtown Market, Clarksville halloween events, Clarksville Humane Society, Clarksville Movies in the par, Clarksville TN, clarksville tn events, clarksville tn realtor, Events, Facebook, Ghostbusters, Go Commando Expo 2013, Go Commando Half Marathon Clarksville, Halloween event, Handsome White Boyz band, Home Run Real Estate Team, home run real estate team clarksville tn, Home Run Real Estate Team Facebook, Home Run Real Estate Team Pinterest, homes for sale Clarksville TN, Hotel Transylvania, house listings clarksville tn, Jazz on the lawn 2013, Liberty Park Clarksville, Pinterest, Reliant Realty, Reliant Realty Clarksville TN, Saturday October 19, Wags to Witches Fur Bash Ball, Weekend Lineup Clarksville TN | Permalink. Come down to this free event and take place in the fun and festivities including contests such as a doggie costume contest, owner/dog look-alike contest, and best trick. Please leave all pets and beer steins at home. Only plastic and wooden steins will be permitted. Jazz On the Lawn – Bring the whole family to Beachaven Winery this Saturday for live music at Jazz on the Lawn featuring the band Midnight Riders from 6:30-9:30pm. Sit back under the stars and sweeping trees sipping Beachaven’s finest wines in the vineyard and enjoy the company of friends or dance the summer night away. Lawn chairs, picnic baskets, and snacks are welcome but please leave all pets and outside alcoholic beverages at home. Categories: Clarksville Home Listings, Clarksville Real Estate, Clarksville TN, Clarksville TN Events, Clarksville TN Events Calendar, Homes for Sale Clarksville, Real Estate, Real Estate Clarksville, TN, TN, What's Going On Clarksville | Tags: 2013 Events Clarksville TN, Beachaven Jazz on the lawn dates, Chris Sutton, Chris Sutton Home Run Real Estate Team, Chris Sutton Realtor, Chris Sutton Reliant Realty, Clarksville Downtown Market, Clarksville Oktoberfest 2013, Clarksville TN, Clarksville TN Bark in the Park, clarksville tn events, clarksville tn realtor, clarksvillenow.com, Events, Facebook, Home Run Real Estate Team, home run real estate team clarksville tn, Home Run Real Estate Team Facebook, Home Run Real Estate Team Pinterest, homes for sale Clarksville TN, house listings clarksville tn, Jazz on the lawn, Jazz on the lawn 2013, Pinterest, Reliant Realty, Reliant Realty Clarksville TN, Weekend Lineup Clarksville TN | Permalink. 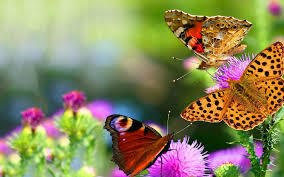 The 5th Annual Butterfly Festival- Saturday, September 28, 2013 (11:00 a.m. – 5:00 p.m) Children will be able to make environmental arts and crafts projects for free. Come and interact with live butterflies in their habitat in our Butterfly House or let the Master Gardeners take you on a tour of the beautiful Butterfly Garden. Entertaining stage shows will be taking place on the Viceroy Stage once again this year. All of this along with face painting, bubble zone and the monster mural! The event will conclude with a live butterfly release of over 950 butterflies at 5:00 p.m. Bring the kids, your class, or Scout troop to the War Memorial Walking Trail, 101 Walter Garrett Lane, in Oak Grove, KY for a day filled with education and fun! 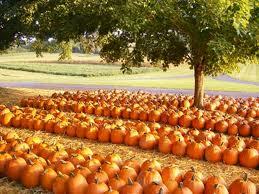 Offering pumpkins for sale, Four acre Corn Maze, Gourds and Winter Squashes. Pumpkins: 25 cents/lb. (most pumpkins are between 8 and 20 lb. costing $2 to $5 each) Corn Maze: Six years old and up $4. Five years and younger Free. Bring the family and enjoy the lovely fall weather at Boyd’s! Learn about farm life as it was many years ago. 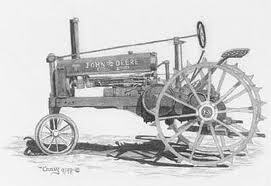 Antique tractor & engine displays. Live demonstrations: silage chopping, wheat thrashing, blacksmithing, etc. Hands-on exhibits: wringer-type washing machines, hand water pumps, corn shelling, etc. Kids pedal tractor pull on Saturday. Planning for Next Weekend? Bark in the Park, Oktoberfest, Jazz on the Lawn, Downtown Market, and Miss TN and Miss TN Teen pageant. Categories: Clarksville Home Listings, Clarksville Real Estate, Clarksville TN, Clarksville TN Events, Clarksville TN Events Calendar, Homes for Sale Clarksville, Real Estate, Real Estate Clarksville, TN, TN, What's Going On Clarksville | Tags: 2013 Events Clarksville TN, 4H Antique Tractor and Engine Show Clarksville TN, Boyd's Pumpkin Patch Clarksville, Boyds Pumpkin Patch 2013, Chris Sutton, Chris Sutton Home Run Real Estate Team, Chris Sutton Realtor, Chris Sutton Reliant Realty, Clarksville Downtown Market, Clarksville TN, clarksville tn events, clarksville tn realtor, Events, Facebook, Home Run Real Estate Team, home run real estate team clarksville tn, Home Run Real Estate Team Facebook, Home Run Real Estate Team Pinterest, homes for sale Clarksville TN, house listings clarksville tn, Oak Grove Butterfly Festival, Pinterest, Reliant Realty, Reliant Realty Clarksville TN, Weekend Lineup Clarksville TN | Permalink. Fort Campbell CFC Kick-Off Concert -the Vicroy in Oak Grove – A fun event for the whole family! Tickets are just $15 for civilians and $10 for Federal Employees and can be purchased here on their website. Kids 5 and under are FREE! This event has inflatables, clowns, and face-painting for kids and food, drinks, and adult beverages will be available for purchase as well. Gates open at 4pm and Darryl Worley performs will perform at 7pm. Make sure to wear work out clothes to this event because you will get sweaty! 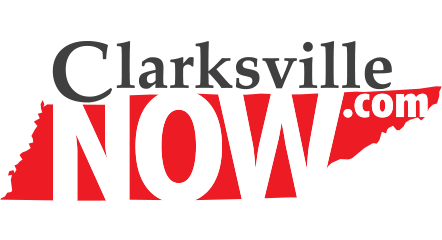 The day will include the ClarksVegas 10k/5k benefiting the APSU track and field team, fitness classes including yoga, zumba, and kickboxing, YMCA obstacle course, Rock Wall, well as a kids corner and booths set up for health and food education. 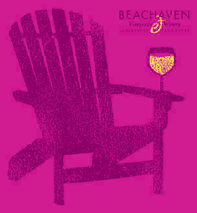 Jazz On the Lawn – Bring the whole family to Beachaven Winery this Saturday for live music at Jazz on the Lawn featuring the band CJQ from 6:30-9:30pm. Sit back under the stars and sweeping trees sipping Beachaven’s finest wines in the vineyard and enjoy the company of friends or dance the summer night away. Lawn chairs, picnic baskets, and snacks are welcome but please leave all pets and outside alcoholic beverages at home. Planning for Next Weekend? Antique Tractor and Engine Show, Downtown Market, Oak Grove Butterfly Festival, and the opening of the clarksville pumpkin patches. Categories: Clarksville Home Listings, Clarksville Real Estate, Clarksville TN, Clarksville TN Events, Home Maintenance, Homes for Sale Clarksville, Pinterest, Real Estate, Real Estate Clarksville, Recipes, TN, TN | Tags: 2013 Events Clarksville TN, Beachaven Winery Clarksville TN, Chris Sutton, Chris Sutton Home Run Real Estate Team, Chris Sutton Realtor, Chris Sutton Reliant Realty, CJQ band, Clarksville Now, Clarksville TN, clarksville tn events, clarksville tn realtor, Downtown Clarksville TN, Downtown Market Clarksville TN, Events, Facebook, Farmers market Clarksville, Ft. Campbell CFC Kickoff Concert 2013, Ft. Campbell KY Events, Home Run Real Estate Team, home run real estate team clarksville tn, Home Run Real Estate Team Facebook, Home Run Real Estate Team Pinterest, homes for sale Clarksville TN, house listings clarksville tn, Jazz on the lawn, Pinterest, Reliant Realty, Reliant Realty Clarksville TN, Weekend Lineup Clarksville TN | Permalink.